Lost For The Moment, Found Happens Tomorrow… | "DESTROY ALL FANBOYS!" I’m in the midst of writing my Lost Dimension review and a few other things, so there have been limited updates. Just pop back in tomorrow for something more interesting to read. 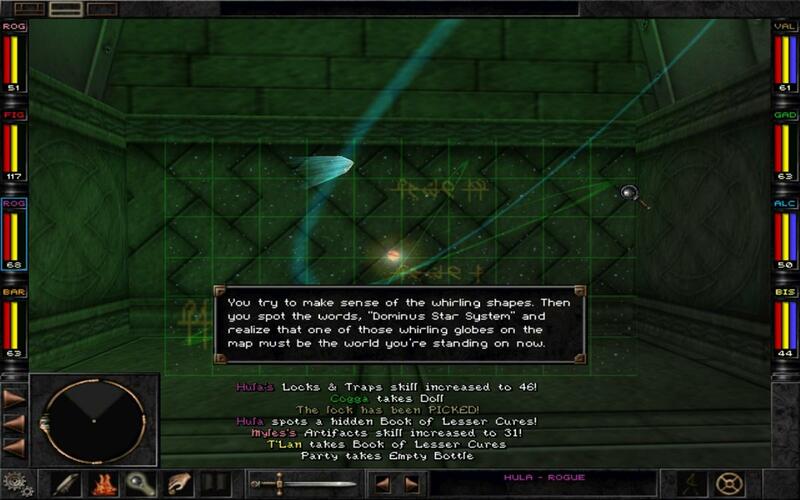 Yes, that’s a screenshot from Wizardry 8, not Lost Dimension. One person will get the joke. Hopefully. Alrighty then, back in a bit. This entry was posted in 2015, Commentary, DAF, Humor, Updates and tagged Atlus, Coming Soon, Incoming!, Lost Dimension, Monday!, Reviews, VGA 101, Videogame Appreciation 101 by geelw. Bookmark the permalink. 3. Hell, of course. It takes no time to get there, but a hell of a time to get back! 4. I was caught in a mosh? 5. I take somewhat long showers and even longer naps in this heat. 6. “Atsa matta fa me? Atsa matta fa youuuuuuuu?!! I got stung by a yellow jacket wasp that pumped so much venom into my wrist that I suffered a serious large local reaction and had to wrap my entire forearm for several days and now I’m just starting to be able to type without irritation. Well, dangit. You just want to share some of that venom with someone else, so yeah, you’ll get bit alright. That and now you’ve made me think of Nicholas Cage in that awful remake of The Wicker Man. Anyway, get better soon!